My great grandmother made each of her 14 great grandchildren a felt pieced stocking. 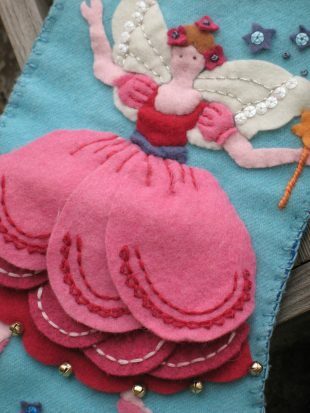 Each one was came from a kit, but was hand stitched, embellished with beads and sequins. These served as an inspiration for my own children’s stockings. It is not my style to use a kit, so I designed stockings that suited my children’s personalities. 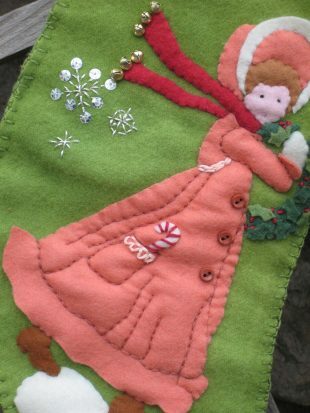 Using an applique technique, I used cut wool felt and other elements to create a winter scene on each stocking. 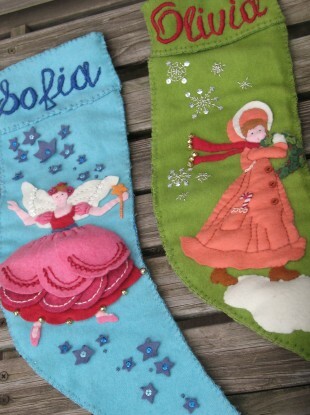 My Granny would be pleased to see someone carrying on her tradition of handmade stockings. What traditions are you carrying on this holiday? Do tell! Thank you for your post and for sharing what you’ve made for your daughters. It would be interesting to see what you’d make for yourself and for your husband. I think that would be a great line of stockings for the girls to see and as they grow up they can start to put things in them. Happy New year! Thanks Alicia. I hadn’t thought of that idea, to make a stocking for myself and Nick! Do you think Santa would fill ours too? Becca! They became so beautiful, lucky girls!